India Vs. Pakistan is a topic that never goes out of trend. 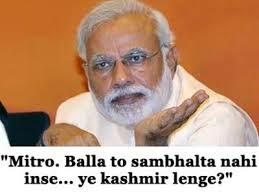 Be it Kashmir Vs Balochistan or Modi Vs. Nawaz, people always has something spicy to speak on these topics. With social media like Facebook and WhatsaApp people have found new and amusing expressions to show their stand on India Vs. Pakistan which they call memes or jokes of social media. The best memes are made on India Vs. Pakistan cricket jokes and a good meme joke Funny pics Images Photos wallpapers can make your day. So, if you are having a rough day then have a look at these some of the best ind vs pak cricket jokes memes that the internet has to offer. 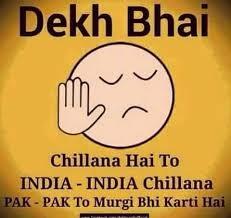 Every cricket fan knows that Pakistan has never won any world cup match they have played against India. People have made numerous jokes and memes on this single line, even big commercial companies have made the funny advertisement based on this.One of the most memorable matches of all time in India – Pakistan cricket history is the T20 world cup final of 2007. It was one of the most nail-biting matches as Pakistan only needed 6 runs from 4 balls. But Misbah-Ul-Haq screwed it by scooping the ball to fine leg, luckily for India captain cool M.S.Dhoni had a placed Sreesanth at that position to take the catch. Here is a joke section first…..
♦ Na ishq me na pyar me. ♦ Interviewer: Vapis aagoge to tumhe goli maar denge. Misbah: Goli se daar nahi lagta sahab, Virat kohli se lagta hai! ♦ LOL and ROFL are old trends. The new one is PROFL – meaning, Pakistan Rolling on Floor and Losing. 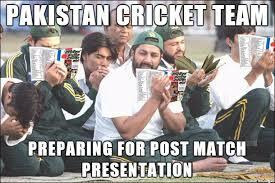 ♦ When is the Pakistan cricket team most under pressure? easy, when they have one run to chase in 30 balls with 8 wickets in hand. ♦ Who said 400+ score can not be achieved, it’s absolutely achievable when Ishant Sharma and Amit Mishra are in opponent team. 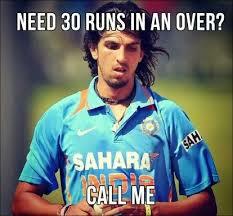 ♦ Dhawan’s Mom: Hello ! Shikhar ? Mom-Beta Jab Phone Karti Hu tuhi uthata hai ? Tu batting Nahi karta kya? ♦ South african captain keeps reminding Indian players, salo tameez se khelo hum pakistani nahi hai, hamari sirf dress green hai !!! ♦ Alia Bhatt to David Dhawan – hello! uncle, congrats! Devid – congrats kyu beta? Alia – wo apke bade bete ne (Shikhar Dhawan) aaj ke match me century mari hai na islye. ♦ Alia Bhatt to Salman Khan – Ye Sohail Khan Pakistan ki tarafse kyu khelta hai? ♦ The tag line of cars rear view mirrors changes from “objects in the mirror are closer than they appear” to “objects in the mirror are loser than they appear” for Pakistan cricket team members after playing with India. ♦ Pak team captain : we won’t let Kohli score 100 this time. captain : simple, we will get all out at 98! If these jokes din’t made you laugh hard enough, then i am sure following memes and trolls will definitely do the trick. You can use this stuff for enjoying in whatsapp and facebook. 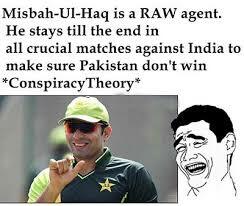 Is Misbha really a cricketer? Laughter is the best remedy to get rid of stress and anxiety, so keep yourself healthy and keep laughing. Hope India will beat Pakistan again.